Hybrid Kinetic Group shows its H600 sedan concept at the Geneva auto show. Chinese electric vehicle startup Hybrid Kinetic Group says it will challenge Tesla with its H600 luxury sedan in the U.S. by the end of the decade. Hybrid Kinetic, earlier called HK Motors, showed off a concept preview of the car this month at the Geneva auto show. 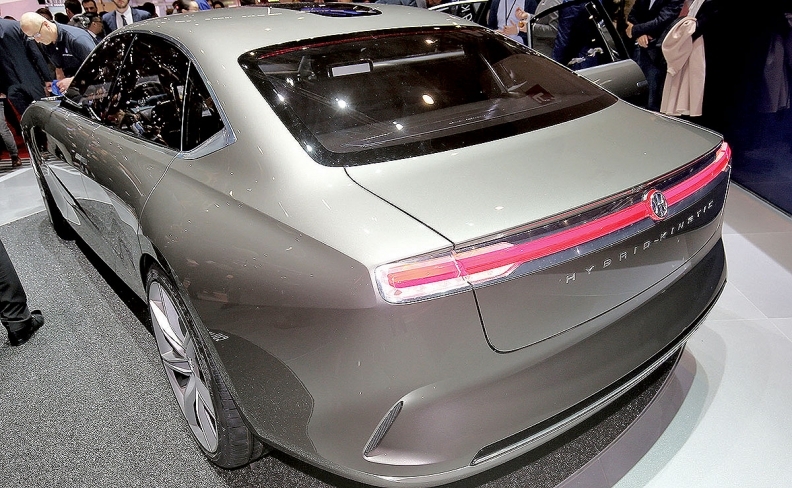 The sleek sedan, created by Italian design house Pininfarina, is "85 to 90 percent" of how the final car will look, board member Carter Yeung told Automotive News. The production car will be powered by electric motors with a combined power output of 600kW (804 hp) fed by a battery pack that can be topped up on the move by a microturbine range extender, the company said. The car represents HK's second attempt at auto production after the company's aborted plan announced in 2009 to build cars in an Alabama factory. HK will now seek to make its cars in China, after a trial production run at Pininfarina's Italian plant. The company aims to build "well over" 200,000 vehicles a year within five to 10 years, Yeung said. The company will unveil two other cars next month at the Shanghai auto show, he said. HK is run by Yung Benjamin Yeung, the billionaire who founded Brilliance China Automotive. Carter Yeung said the H600 will launch first in the U.S and China in 2019-20 as a rival to the Tesla Model S and other premium sedans. One target will be Mercedes buyers. He insisted the company is realistic in its plans. "A lot of Chinese companies overpromise and underdeliver. We're going to be the opposite," he said. Asked whether he thought the company had overpromised on the Alabama factory, he said: "We're always going to make mistakes. It's how you recover from those that defines how this company will be run in the future."